What happens in an individual session? Voice Movement Therapy is an expressive arts therapy which seeks to embody the voice, calling up the stories and songs which we inhabit and which inhabit us, while opening up the vocal range. 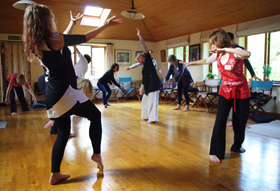 By combining therapeutic principles with breath, movement, imagery, song and improvisation, VMT provides opportunities for exploration of the self and expression of the human condition, providing a forum for emotions to exist and be transformed. If you can make a sound, you can sing. The voice is the first instrument, coming from the depths of human existence. Through VMT the selves which exist beyond language can be expressed as we sing ourselves into being and allow the matter of the soul to become audible. This work was born of the desire to find and bring about healing through the voice. • yearn to more consciously hear and know themselves. Singing is the essence of life. From time immemorial people have sung as a way of sustaining hope in the bleakest of environments, drowning out the clamour of the mundane world when it seeks to haul us in and cover us in darkness, and reaching inside to renew contact with the sparks of humanity which live in joy, engagement, conviviality and ecstasy. VMT is the freeing of ourselves, of loosening lips, tongues and hearts made heavy with sorrow and sleep; putting the words of ourselves to song, carving from the stone of existence and allowing the song and dance to find their own shape, singing the language of the soul. Our voices are us, coming from the inside of us to the outside, expressing all our hopes, fears, desires, pasts and possibilities. Voice Movement Therapy was founded by Paul Newham inspired by Alfred Wolfsohn’s pioneering work on the human voice and its psychological implications, Roy Hart’s work on the human voice and theatre, otolaryngologist Paul Moses’ study of voice, and the psychological work of Carl Jung. Voice Movement Therapy, predicated upon Wolfsohn’s research, was born of the desire to bring a voice of healing into the world.